Where’s Mark been? I’ve been hauling a lot of stuff lately. It all started when we agreed to temporarily store some shelving for the MCC farm manager last fall until the new incubator building was enclosed, then wait until it was complete, then wait until the dedication, then wait, well, I couldn’t wait until the next wait – with our garage torn down, I needed some more space, so started loading, hauling, and unloading a small grocery store’s worth of loizier shelving. Fortunately, fuel pellets were on sale, so it was not a wasted trip. All the shelving is now removed – about 9 trips to town, and 230 bags of wood pellets hauled back to the farm – two tons tucked in the basement and two and a half tons in the shed – they were on sale, so I wanted to get as much of a winter’s supply as possible. 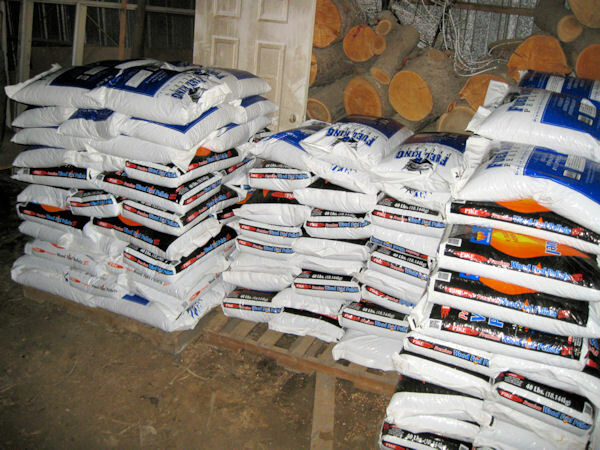 With corn flirting around $5 bushel, the pellets are a better deal this winter. I’ve also been hauling a bit of hay, but have more of that to fetch. I am always heartened when academic freedom and scientific integrity are vigorously championed, and I appreciate your taking the time to share your concern with me. 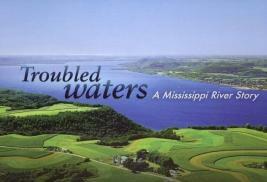 As has been publicly stated, “Troubled Waters: A Mississippi River Story” will be shown as scheduled on October 3, 2010, immediately followed by an open discussion of the film. 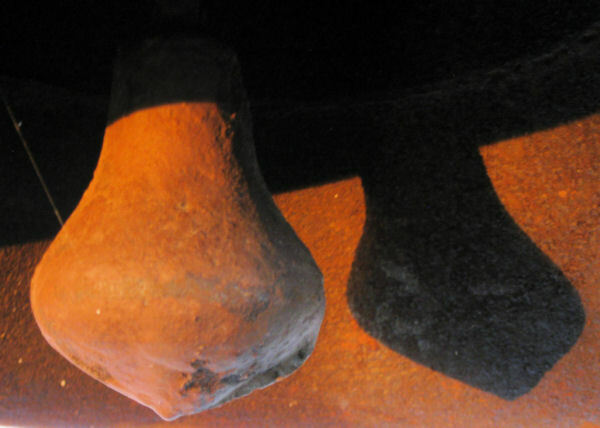 The original decision to postpone the showing of the film at the Bell Museum and the rationale behind that decision could have been handled differently and communicated more clearly by the University. At no point, however, was there a question about the importance of the issues raised in the film or whether such a film should be made and shown. We will continue to review this situation, and I am confident that we will learn from this and improve our procedures as we move forward. Thank you for your commitment to the mission of your alma mater. September 27, 2010 – Google Maps Might not Show the Best Route! Thanks to Claire for pointing out this new feature of Google maps. I put in I wanted to go from Des Moines to China. By george, it did it – taking me over as much land as possible. It included a 2,756 mile kayak to Hawaii, then overland in Hawaii, then a 3,879 mile kayak from Hawaii to Japan, overland in Japan, and finally a break from kayaking as it suggested a short 486 mile jet ski from Japan to China! 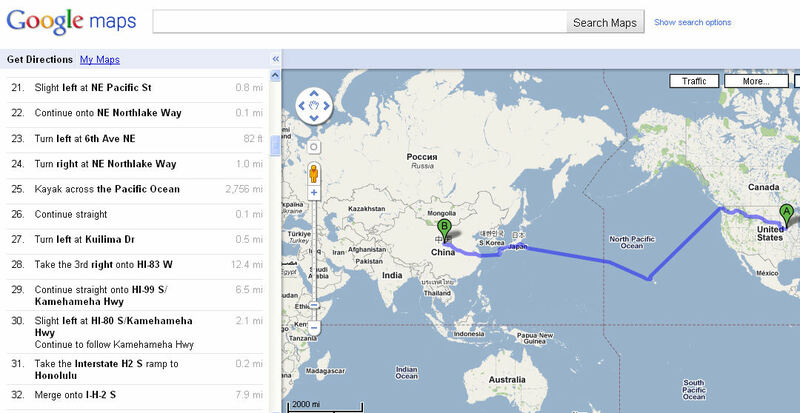 The route is 11,124 miles and it should take 38 days and one hour according to Google. I think the time calculation must not take into account carrying your kayak and jet ski overland across Hawaii and your jet ski overland in Japan. That’s got to add a week to the trip! Who’s going to be the first one to try this and then have their family sue Google after the kayak overturns in Puget Sound and drowns the poor sap trying to kayak to China! Now the unglamorous portion of the gardening season begins (is there a really a glamorous portion)? But in some ways it is as important as what happens during other seasons. Here’s the tomato cages, posts, dead vines and seedling protectors all pulled and ready to move to their appropriate places. 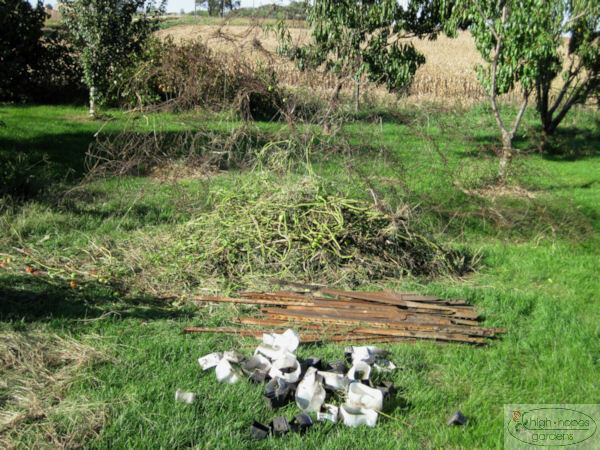 It’s good garden hygiene to remove the old vines and plants from the gardens, especially tomatoes and squashes. 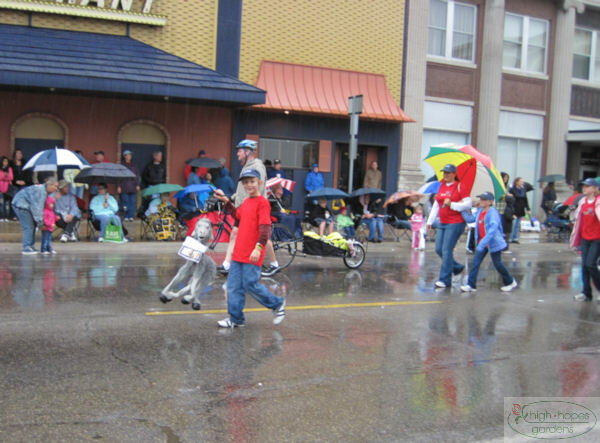 Today was the community celebration day in Marshalltown. There’s a couple of new groups in town that wanted to get some visibility. The “Eat Smart, Move More, Live Well” is the name of the program. 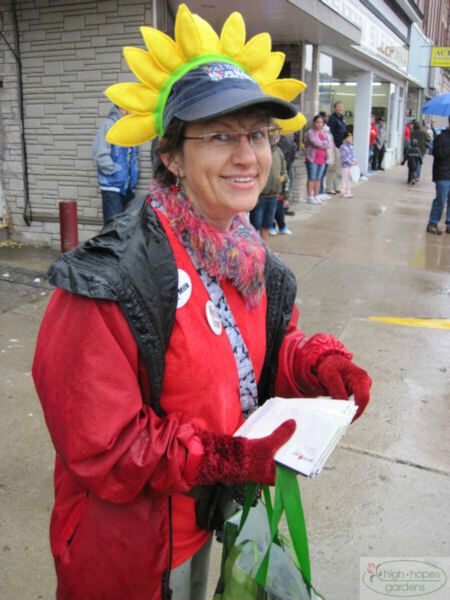 Linda’s involved with a supporting group called Harvest from the Heart of Iowa – a local food group. Eating healthy is just one component of the larger group. Linda passed out flyers and Martin carried a local goat! 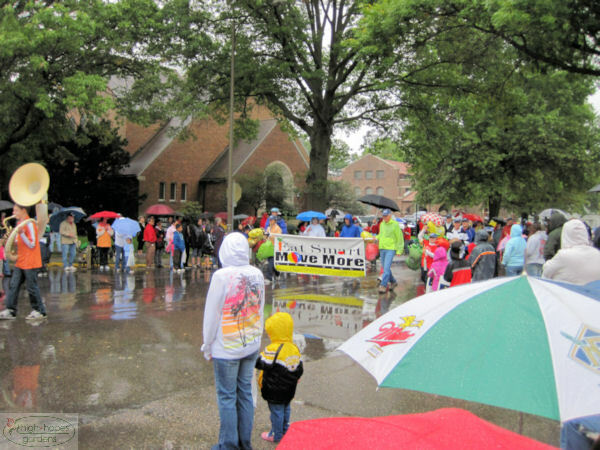 Even though the day was rainy, some people are perpetually sunny! After an uproar, the Troubled Waters film I blogged about a few days ago is back on, according to the University of Minnesota officials, who all seem to be playing with a different playbook and set of rules as the reasons and rationale seem to change daily after a PR director stopped the release of the film. Does every work of literature, poetry, film, publication, brochure, theatre production now require the imprimatur of the head PR person, or just those that she disagrees with? So this situation violates two “Intro to PR” principles. First, by disappearing while the story broke and unfolded – the “U” let others define the story by their lack of response and absence of the PR person not making statements, in this case for many days. Secondly, there is no better way to bring public notice to something you want hidden than to ban it and have ensuing firestorm bring the item to everyone’s attention, rather than just the few academics who might have otherwise seen it. The university is now adding additional screenings to accommodate a much higher anticipated audience than the film might have otherwise had! 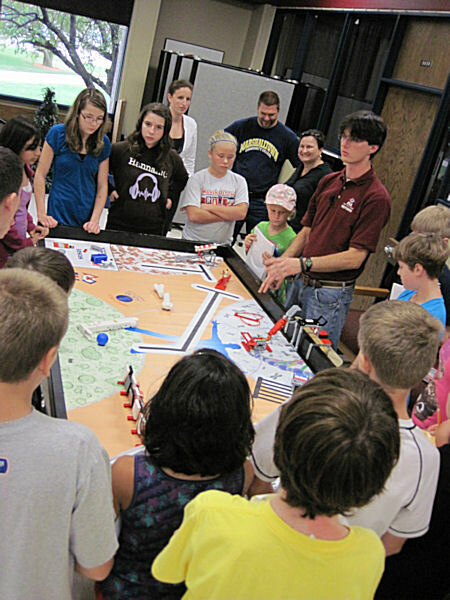 My “off-farm” volunteering this year includes a coach/helper for Martin’s First Lego League team. We’ll have more about the team later, but today’s event centered around team-building. 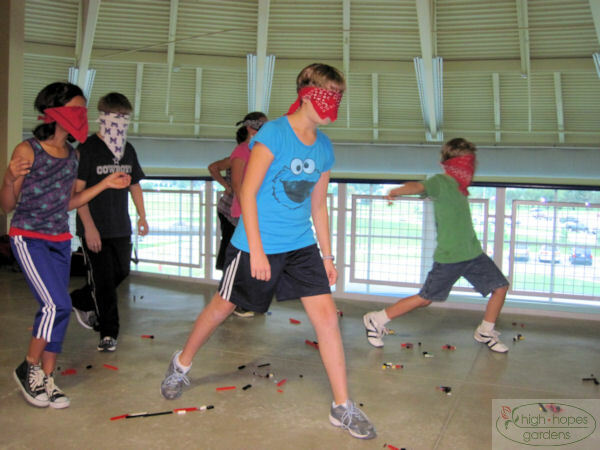 The first step was to partner up the kids, blindfold one, and have the the “sighted” one guide the blindfolded one through the lego mine field. 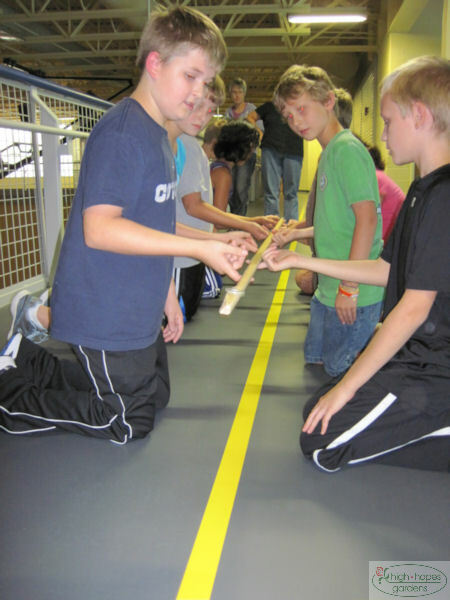 This was a great activity and analogy for making a lego robot as the blindfolded kids represented the robot and the kids giving instructions represent the robot programmers. 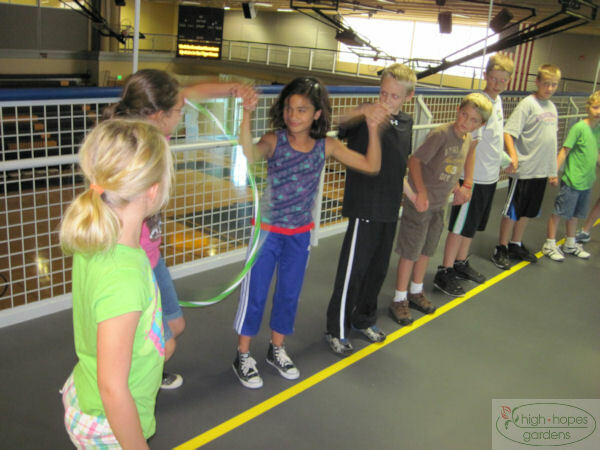 Who can’t have fun with moving a hula hoop down a line without breaking hold of the hand of the person next to you! The final part of the day was to review the official board and rules of the robot challenge. I don’t quite know how to explain this one, but here goes. Hey, I can chime in because I have two degrees from the University of Minnesota and am greatly saddened by the events of the last few days. Here goes a quick overview. Private donors give the University of MN money for a film documenting the impact of agriculture on water quality. They hire an Emmy and Peabody award-winning film-maker whose work appears on PBS NOVA series and other respected channels. The film shows the impact of commodity agriculture on water quality. The donors think the film is great. Two weeks before the film’s premiere on campus and statewide public TV, a University PR person pulls the plug saying it hasn’t met the University’s scientific review. Well, it turns out it does pass the review (remember, it’s not a schlock filmmaker, she’s put out accurate, interesting work for years). OK, so that doesn’t work, now the explanation is that the film shows specific sustainable farmers that sell farm products, so the university can’t release the film because they will be promoting products by companies – and these are bad mega companies – an organic milk co-op and a grassfed beef company. News flash to U of M – Hey, you know that new football stadium, I think it’s called “TCF Bank Stadium,” I’ve got a secret to let out of the bag – shhhh, the bank sells products. And about that Cargill Building of Molecular Genomics on campus, it might surprise you, but Cargill sells BILLIONS of dollars of products. And hey, you’ve gone as far as not only naming structures after companies, but entire university programs – that Carlson School of Management for instance. And by golly, what a coincidence, the Carlson company sold 38 billion dollars worth of products and services in 2008. I expect all those names will be removed in light of the new university policy that prohibits university mention of companies in any university-related publication or film, even if they aren’t funded by the U of M! To read more about the bruhaha, check out the Land Stewardship Project page, with links to NPR, Star-Tribune, Pioneer Press and other media outlets stories on the film. 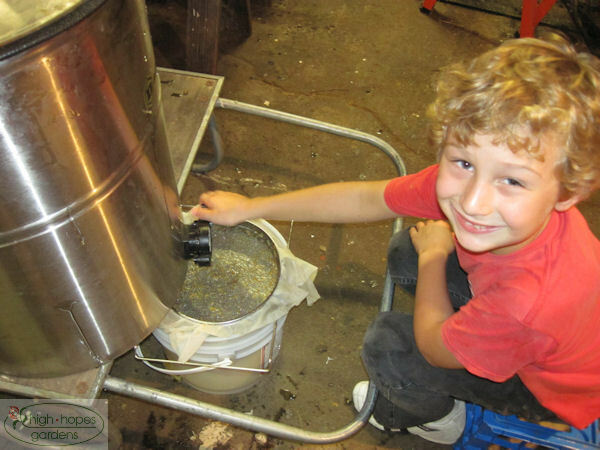 Today was a big day at high hopes – honey extraction day! It was a rough year for beekeeping. 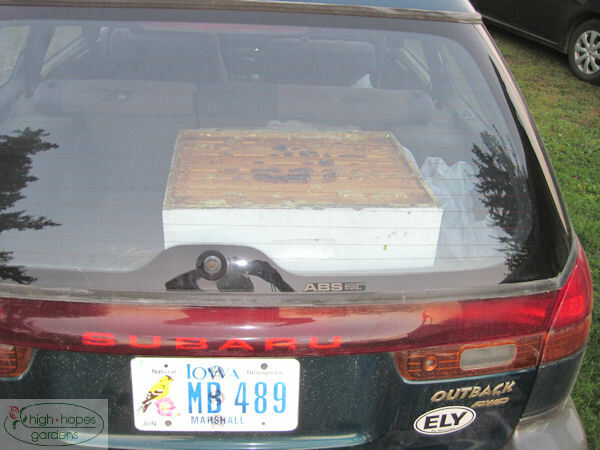 We have three hives. Two of the hives were new this spring, so first year’s don’t often produce to much as they have to get organized and numbers bred up. The other hive swarmed, so lost some worker bees as well. Then, with the wet weather, it was hard for the bees to get out. 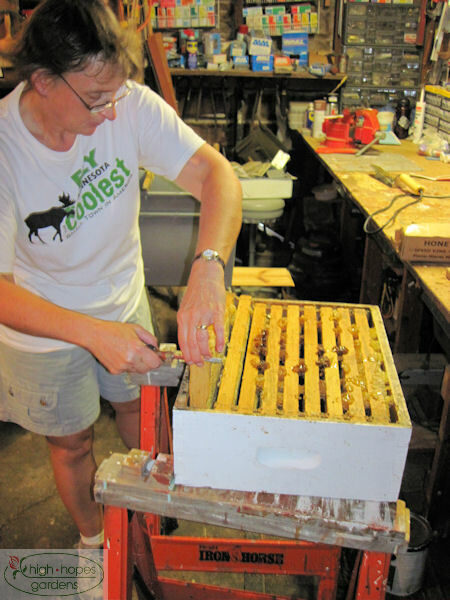 I missed Linda retrieving the supers from the hive – but here they are in the back of Sube. The idea is to get the supers during the day when many of the bees are out foraging. Then, you need to protect the stolen supers from the hive as they will try to retrieve the honey and the supers will be surrounded by an angry swarm. So, they are locked in the back of the car. Here’s a blue-ribbon frame – full and robust. Worth its weight in gold is the electric uncapping knife to slice off the wax caps from the comb. 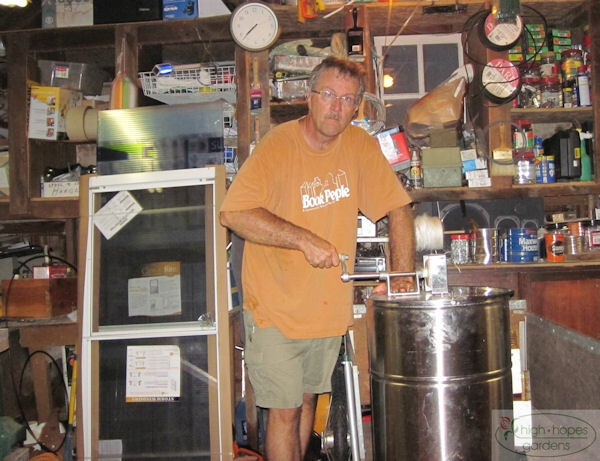 Here’s a really angry-looking guy spinning the manual extractor. 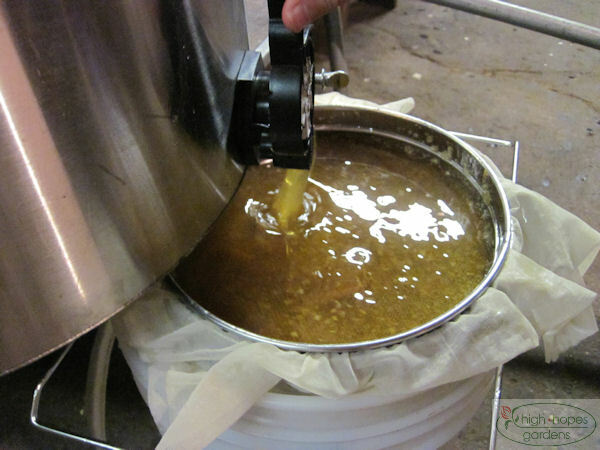 The spinning of the extractor slings the honey out of the frames. Spin for a bit and them turn the frames around and spin again. He must have known that the next morning would bring aches of muscles usually not used! Martin guards the honey gate at the bottom of the extractor. 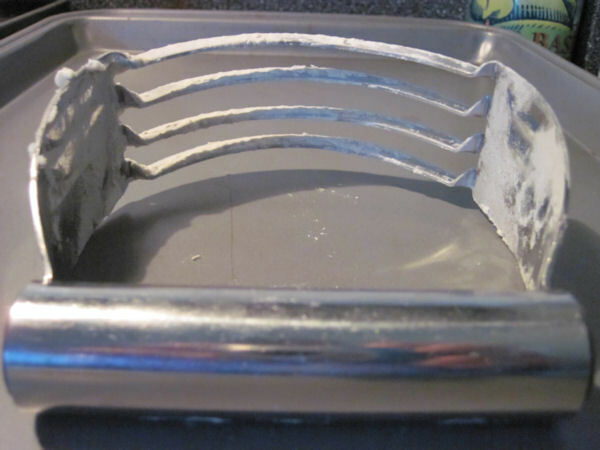 The honey filters through three filters – a coarse mesh filter and a finely-woven fabric supported by another metal filter. Finally, the honey safely tucked in jars. We ended up with about 10 gallons in total! The honey this year was very amber. 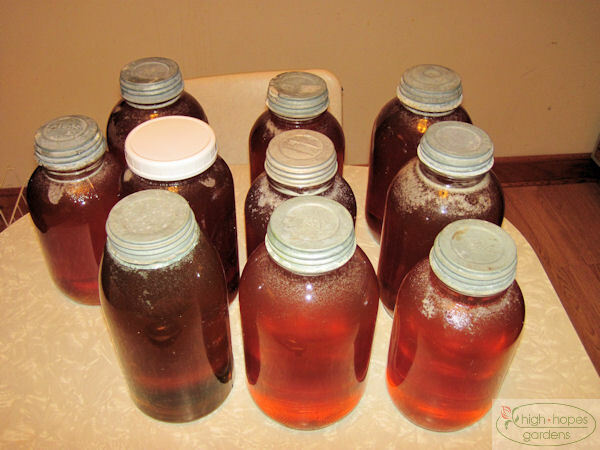 That color is not what is typically is commercially available, despite the fact that dark amber honey has up to 20 times the anti-oxidants of run-of-the-mill commercial light honey. 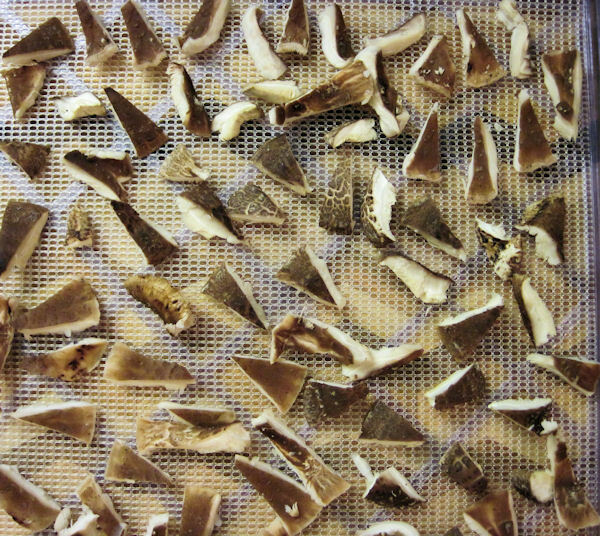 I cut up and dried the rest of them for savory winter-time cooking. OK, so this post is mainly for grandmothers out there and has nothing to do with farming (no bad jokes about this farmer’s daughter!). 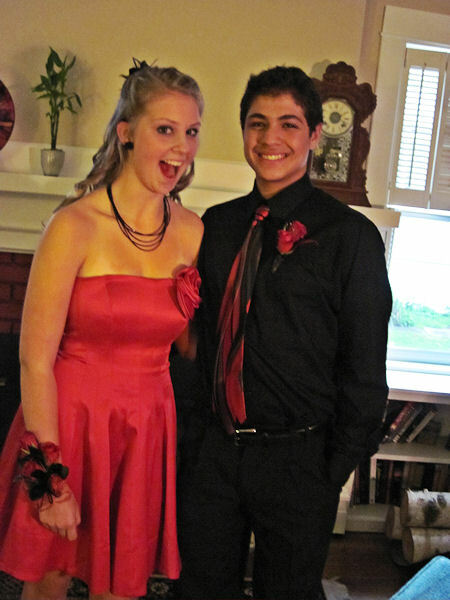 It was homecoming weekend and Emma was happy to get all dressed up with her gaggle of friends and go to the homecoming dance. Ready for dinner at a friend’s house. 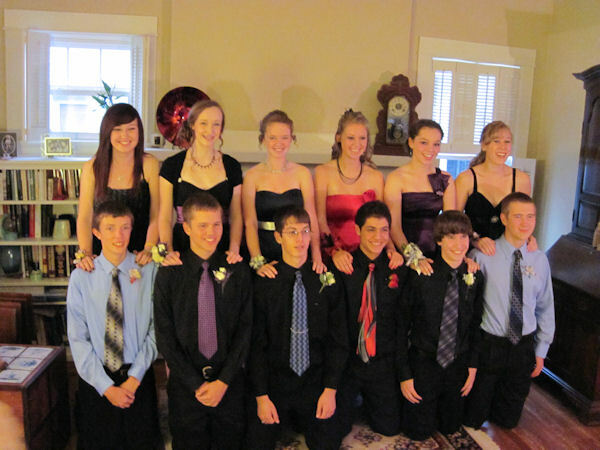 The group of girls and their friends/dates. I’m part of the a farm energy working group. The group contains folks from power companies, alternative energy companies, education, farmers, and some others. As part of today’s meeting, we visited a number of solar arrays and wind turbines near Kalona. 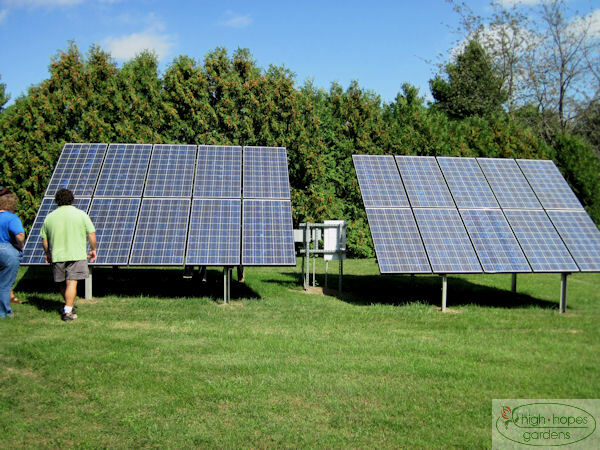 This is 3.6 kW 20 panel flat array. 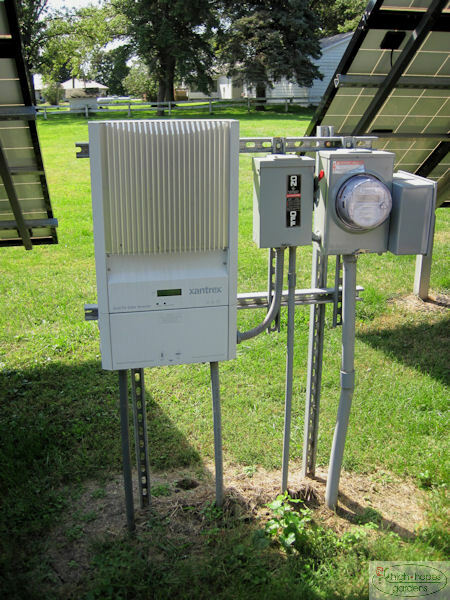 It averages about 500 kWh per month and cost the installer about $20,000 (he did the installation himself). Here’s the controller, inverter and meter for the system. Wouldn’t his be a nice complement to a wind turbine!